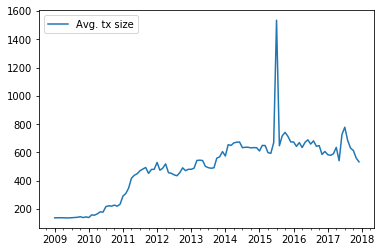 I'm curious, since the inception of bitcoin, what is the average size (in bytes) of a bitcoin transaction? To be clear, the easiest way to find this is not to take the size of the block-chain and divide it by the total number of transactions. This is because there is a little overhead associated with block headers. Transactions need to be accounted for one at a time for this averaging operation. Has anyone taken the time to analyze this information and, if so, what were the results? To be clear, I am interested in this answer as the data is stored in uncompressed-bytes. I'm not interested in any textual (i.e. JSON) variation which might be used for network communication. Just to give a few exact numbers, the current average transaction size (of all existing transactions until block height 498920) is 522.45 bytes. If we take into account just the first 100000 blocks, then the average transaction size was indeed 238.51 bytes. The peak on mid 2015 is produced by this 999657-bytes transaction. These values can be computed using BlockSci.